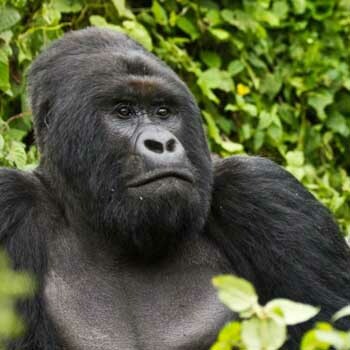 Uganda Gorilla Safari destinations – Where can i do a Uganda Gorilla safari from? In Uganda, Gorilla safaris can only be done in Bwindi Impenetrable National park and Mgahinga National Park. These are the only National parks with these gorgeous species. Our first choice is gorilla trekking in Bwindi forest ahead of Mgahinga national park. Bwindi Impenetrable National Park is located in southwestern Uganda, a glorious verdant swathe across the steep ridges of the Albertine Rift Valley. This ancient rainforest is one of the few in Africa to have flourished and a home to half of the world’s endangered population of mountain gorillas with estimated number to be 400 individuals. The Impenetrable Forest Reserve was gazetted in 1942, upgraded to the Bwindi Impenetrable National Park in 1992 and recognized as a World Heritage Site in 1994. In the local language, Bwindi actually means “darkness” and this is because of the way the forest is dark with no sunshine passing through the thick forest. This double warning is apt, for Bwind is all but impenetrable; 327km2 of tangled vegetation draped over a deeply fissured landscape of steep, slippery valleys and high, droughty ridges. But if the terrain is far from easy to negotiate, it is well worth the effort. A trek through this thick forest, one of Africa’s most ancient rainforests, in search of the threatened Mountain Gorillas, ranks among the world’s premier wildlife adventures. Bwindi can be cold particularly in the morning and at night, the coldest months are June and July. Warm clothing is required plus wet weather gear since Bwindi receives up to 2390mm of rain/year. This is intense during the wet seasons, short rains in March-May and heavy rains in September-November. Instead of short tropical deluges, rain in Bwindi often falls as long hours of soft drizzles. Mgahinga Gorilla Park is Uganda’s smallest national park; there are three volcanoes in the vicinity of Mgahinga national park making it an intense tourist destination. The peaks near Mgahinga are part of the Virunga mountains where almost half of the remaining mountain gorillas are found; 380 gorillas roam the slopes of the volcanoes while the remaining 340 live nearby in Uganda’s Bwindi Impenetrable National Park. A visit to mgahinga is also fascinating for sightseeing and nature tourism, hiking to the summit of Mt. Muhabura. Mgahinga park lies lies in the south-western corner of Uganda, 540km from Kampala. The journey takes 8 hours, excluding rest stops, passing via Kabale and Kisoro. The 80km section between Kabale and Kisoro is a winding, mountainous drive on murram that takes at least 2 hours, while the park gate at Ntebeko lies a bumpy 14km (30 minutes) south of Kisoro. Charter flights can be arranged from Entebbe or Kampala (Kajjansi) to Kisoro airstrip.